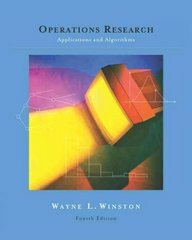 Operations Research 4 Edition The market-leading textbook for the course, Winston's OPERATIONS RESEARCH owes much of its success to its practical orientation and consistent emphasis on model formulation and model building. It moves beyond a mere study of algorithms without sacrificing the rigor that faculty desire. As in every edition, Winston reinforces the book's successful features and coverage with the most recent developments in the field. The Student Suite CD-ROM, which now accompanies every new copy of the text, contains the latest versions of commercial software for optimization, simulation, and decision analysis.